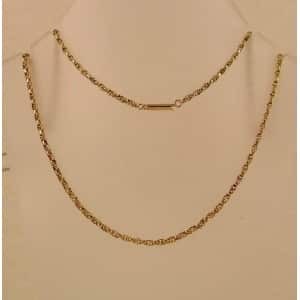 ANTIQUE ROLLED GOLD DOUBLE ALBERT CHAIN WITH 5 STAR PENDANT IN LOVELY CONDITION. THE BAR IS STAMPED BEST ROLLED GOLD S P ENGLISH MAKE. 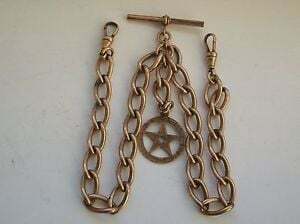 THE SWIVELS ARE ALSO STAMPED S P. TOTAL LENGTH 14.5″. 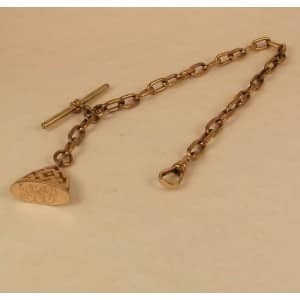 PENDANT AND CHAIN ATTACHMENT 2.5″ LONG. PENDANT DIAMETER 21 MM. 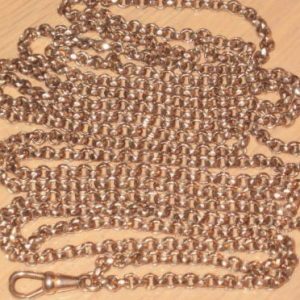 LINKS MEASURE 15 MM LONG AND 8 MM WIDE. WEIGHS 42.4 GRAMS. 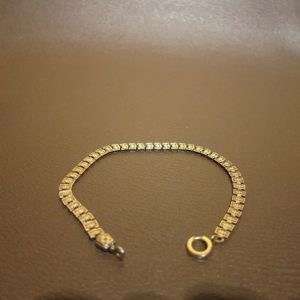 THE SP MAKER MAY SUGGEST IT IS 18 CARAT ROLLED GOLD.